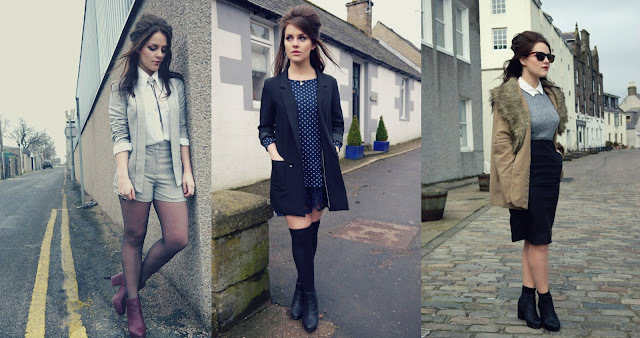 My first blogger of the month for January 2013 is... Amy Bell from Little Magpie! I love her 60's style, she always wears her hair in this perfect beehive and her outfit shots are so good, they genuinely look like part of a magazine shoot. I feel like Amy is quite daring with her fashion but in a way you don't notice at first because she tends to stick with muted colours and classic prints. When you think of daring fashion, it conjures images of mental people who wear shoes on their head; people like Anna Piaggi but Amy is daring in a more subtle way. Like the way she wears a jacket/short sequin suit in the below picture, short suits are a trend thats quickly making it's way onto the high street but Amy was the first person I saw doing it and it's definitely not something for the faint hearted! I think one of the reasons I like her style is that it's quite similar to mine, I like dark colours, feminine shapes and grungy boots, and just love seeing how Amy puts things together, adding neck ties and statement necklaces. What do you guys think of Amys' style? Do you like the idea of me doing a 'blogger of the month' feature? Thanks for posting, I've just discovered a great new blog! I'm going to check her blog out ! It looks amazing ! Amy is one of my favourite bloggers too, I love her style and it's something I would like to try more of as it suits my kind of persona if you get me. I love her blog so much! It might be the perfect hair... GIRL CRUSH, fo sho. She is stunning, yes please for more blogger inspirations! Her style is amazing, thankyou for mentioning her. Blogger of the month is such a cute idea! Amy is my FAVOURITE blogger. Period.